Back when we were called Scrapbook Royalty we held lots of crops every year! Then we expanded to Charity Wings and we kind of lost our cropping mojo! But we are ready to crop with y'all again! So come joins us for some fun! March 1-3, 2013 We will be joining Scrappin' Escapes for a fun mini class and fairy fly by on Saturday during their 3 day retreat. 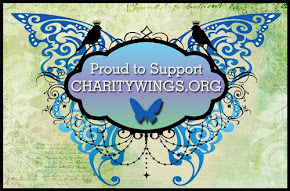 There is still room and Jessica is offering special pricing just for Charity Wings supporters! Are you ready to join one of the best indie business & DIY conferences of 2013? Craftcation is a four -day event with top industry professionals who will lead you in workshops, panel discussions and Q&A sessions for business, art, craft, and food. This is an event that you can't miss! Crafty Chica is the keynote speaker for this year's conference. And Elena will be there to mingle and talk about the Charity Wings Art Center.Make sure to find Elena to get your free Wing Art Button. Find out more information HERE! Hurry – registration closes March 1st! It may have been three months since Hurricane Sandy ravaged New York and New Jersey but the need for help continues. I took my first trip to New York City last summer and I fell in love with it. It breaks my heart to think of any part of the city being destroyed by the hurricane; but even more, it breaks my heart to think of people…of families who have lost their homes and their livelihoods throughout New York and New Jersey because of the storm. One of the areas still struggling to make repairs is the South Street Seaport in Lower Manhattan – my favourite part of the city! According to an article in the New York Times, the retail area of Pier 17 and the South Street Seaport Museum are fully functional again but the rest of the area are shuttered. Apartments remain uninhabitable as the electrical systems and boilers continue to be in disrepair, the South Ferry subway station was so badly damaged that it has been “closed indefinitely”, and many businesses still don’t have phone service or the ability to process credit cards. Others, in New York Public Housing, report continued problems of no heat, no running water, no electricity, no elevators, mold, and backed up toilets. There are elderly residents trapped on upper floors, relying on others to bring them food and water. Complaints of invasions of water bugs, cockroaches, and mice abound. The stories of devastation go on and on. As I sit in my comfortable house with a full belly of food, my dog curled up on my lap, watching TV and hanging out on the internet, I don’t think I can even come close to imagining what the victims of Hurricane Sandy have been through – what some continue to go through. I remember that big blackout of a few years back and going without power or air conditioning for 48 hours – I thought that was unbearable and yet, it’s nothing to compare with what many Hurricane Sandy victims are still enduring, three months later. We can help them. You and I. A group of artists gathered together to create Hope for Hurricane Sandy – the beautiful piece of art pictured above. We’re selling prints of this stunning work and the money goes to the victims of Hurricane Sandy. Won’t you buy a print and help us to help them? They still need us. We Went on a Prima ArtVenture! Recently, Charity Wings was invited to take part in Prima’s ArtVenture art retreat and we had a fabulous time. There was so much to do and some much creativity being shared. Elena designed a beautiful necklace for a make ‘n’ take. Here’s Jackie with her pieces – she made some for her friends! Prima generously allowed everyone to do as many of the make ‘n’ takes as they wanted and Jackie sure did! Besides the make ‘n’ take, we got to host a beautiful auction to benefit the Charity Wings Art Center. Participants in the retreat as well as our followers on Facebook were able to take part in this auction and we raised nearly $900!!!!!! WOOHOO! Check out some of the amazing auction pieces below! Thanks so much to Prima and to all of you for your support – with your help the Charity Wings Art Center is becoming a reality!